The Chicago Code: "Greylord & Gambat"
Given that The Chicago Code is no more (at least on Fox, and probably on television in general, barring a big surprise), I confess that my mood going into tonight’s “Greylord And Gambat” was a little bit on the “let’s just get this over with” side. And then, whaddaya know? The show delivered the kind of episode I’d been asking for since my write-up of the pilot. What I’m really anxious to know is whether The Chicago Code’s stories will be as unpredictable and intense as those on Ryan’s two FX shows. Will it have those moments when the heroes make terrible mistakes and back themselves into corners with no clear escape? The Fox executives would like to prove that a cable-style drama can make it on a major network, even after the ignominious failure of last fall’s Lone Star. So they’ve been pushing The Chicago Code hard for months, and even changed the name from the funkier but less punchy Ride-Along. The problem though is that is that even veteran TV watchers and creators disagree on what “cable-style” means. More violence? More profanity? More sexually explicit? To me it has to do with a level of sophistication and maturity, and a willingness to push audiences instead of pandering. It has to do with the writing and the direction—not whether the material can get past standards and practices. Now, I can’t say that tonight’s episode was completely pander-free. There were a few too many lucky twists of fortune, and maybe a bit too much, “Hey, remember that thing we mentioned eight episodes ago? Here’s why it was relevant.” But I loved how with one episode to go in the season, The Chicago Code writers stepped on the accelerator, moving the story much further along than I’d expected them to in a single hour. I also appreciated that they did so in a way that was fleet and easy to follow. (Honestly, a newcomer could’ve watched The Chicago Code tonight and not have been too lost.) It helped that Superintendent Teresa Colvin began the episode by suiting up and delivering a swift summary of the story so far (set to Kanye West, no less). A grand jury has been en-paneled now—has anyone ever created a legal drama based on grand juries before? because that would be cool—tasked to examine the connection between the Irish mob and Alderman Ronin Gibbons. The star witness: truck driver Ronny Underwood, who has been a cog in Chicago’s political machine and has seen who’s pumping the gears. The problem is that Underwood has panicked and hit the road prior to his grand jury appearance, after telling his girlfriend Penny and the boys at his poker game about what he’s up to. Colvin and her inner circle now realize that they have limited time before Gibbons gets tipped off to the existence of the grand jury and the case against him, so they have to move fast. Teresa has mob boss Hugh Killian arrested, and begins interrogating him. (When Killian says that he and Gibbons’ relationship is the same as the one between Teresa’s mixed-race parents, she cracks, “The two of you met in high school and fell in love?”) Meanwhile, they debate whether it’s time to bring undercover agent Liam Hennessey (a.k.a. Officer Chris Collier) back out of the cold, so he can testify against Killian and Gibbons and get out of harm’s way. I’ve been critical of Liam’s character all season, but he’s fairly effective in this episode. While Detectives Jarek Wysocki and Caleb Evers go looking for Penny (who works in a “happy ending” massage parlor), they have no idea that Liam and one of his Irish mob cohorts have already tracked her to her home, and have offered her money to entice her to call Ronny. 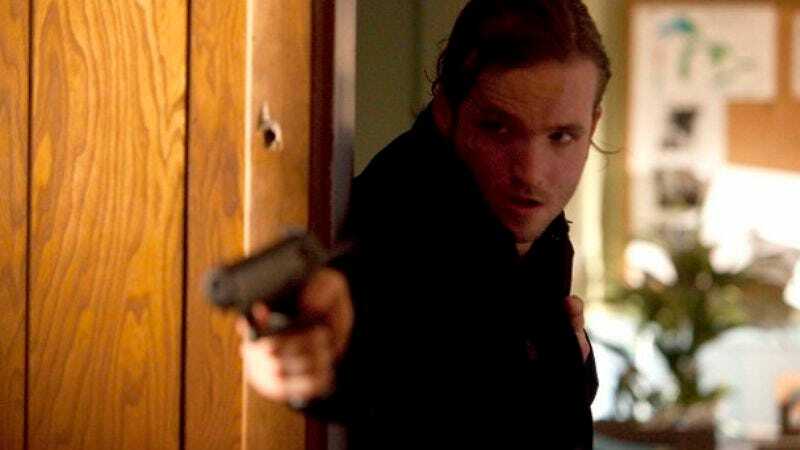 When Liam learns that Killian wants him to stab Ronny and Penny once the informant arrives, he actually thinks fast for once and stabs his mob associate instead, then hides Ronny and Penny and comes up with a quick, surprisingly convincing lie for the other Irish mobsters who come knocking on Penny’s door. Wysocki then puts the call out for Liam to come in, but he has one last piece of business to conduct first. (I can’t help it; I’m a sucker for “let me do this one last thing” wrinkles to action plots. It’s something The Shield always did so well.) Liam goes to see Killian’s convenient daughter Elizabeth, who has a convenient ledger that links Killian’s shady business deals to Gibbons. Unfortunately, Liam will need to authenticate the ledger at trial, and not long after he obtains it, he gets shot. Wysocki and Evers are able to swoop in and contain the scene before Liam dies—Evers even gets his first kill, which doesn’t seem to bother him that much—but when they get Liam to the hospital, he’s barely hanging on. So while everything seems to be going our heroes’ way, nothing is cut-and-dried when it comes to crime and punishment in Chicago. “I didn’t invent this system,” Gibbons tells Wysocki, while trying to get him to understand that everyone would benefit under Gibbons’ rule, even if it wouldn’t exactly be democracy. The question now is whether one of those potential (or past) beneficiaries will ride to Gibbons’ rescue. And it’s a question I’m very eager to see answered, even if it’s the last answer The Chicago Code will ever give. Tonight’s episode was directed by Paris Barclay. Good get.